Why do naturally talented people frequently fail to reach their potential while other far less gifted individuals go on to achieve amazing things? The secret to outstanding achievement is not talent, but a passionate persistence. In other words, grit. This is the July installment of The Rezooming Attorney and so I’m adding an additional book to the summer reading list of my rezooming readers. 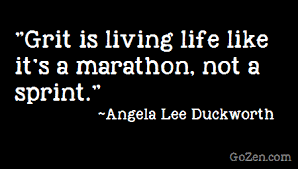 I just finished reading the book Grit-The Power of Passion and Perseverance by Angela Duckworth. It will assure you have the grit to rezoom. If nothing else, we rezoomers have grit as we re-enter the legal world after a hiatus. What Ms. Duckworth says beyond this grit will amaze you and help you successfully navigate your reentry! “Focus on one thing at a time.” Find out what your passion is and keep learning about it until it becomes second nature, gets under your skin and becomes part of your DNA. Duckworth spoke on CBS this Morning about substituting following your passion – the mantra of commencement speeches – to foster your passion. I love that tweak. It takes the pressure off of those of us who don’t yet have a passion we feel committed to pursuing. We are still exploring and allowing ourselves to learn new things. Passion is a process; some come by it easily, some need to do a bit of weeding until they hit the sweet spot. Whichever path you take, your grit will keep you moving forward. If you foster your passion, at the beginning you will always learn something. What you learn will end up leading you to your true passion. Passions are developed over time; you just don’t find one. Do what’s difficult first, practice to get better at it, fail and get feedback. Duckworth suggests that you keep at it until the, “natural end,” which, when translated, means no quitting when the going gets tough. You chose this challenge; see it through to the end. Look for the ying and yang of your passion, “desire self-respect over self-expression and encourage intellectual curiosity and independent reasoning. “ We need to encourage ourselves to have grit and foster our passion(s). Duckworth closed by saying why grit trumps talent. Duckworth indicates clearly that effort is two times more important than skill or talent. Focus on what you want; foster passion, practice don’t quit and you will easily be able to rezoom your legal career. Now get out there and Rezoom!